Publication date: 9 July 2013 | ISBN: none. Available from Amazon as a Kindle single. Everything you thought you knew about nuclear power is wrong. 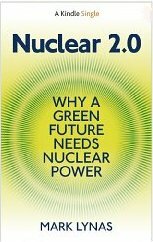 This is just as well, according to Mark Lynas in Nuclear 2.0, because nuclear energy is essential to avoid catastrophic global warming. Using the latest world energy statistics Lynas shows that with wind and solar still at only about 1 percent of global primary energy, asking renewables to deliver all the world’s power is “dangerously delusional”. Moreover, there is no possibility of using less energy, he reminds us, when the developing world is fast extricating itself from poverty and adding the equivalent of a new Brazil to global electricity consumption each year. The anti-nuclear movement of the 1970s and 80s succeeded only in making the world more dependent on fossil fuels, he shows: its history is “not lit by sunshine, but shrouded in coal smoke”. Instead of making the same mistake again, all those who want to see a low-carbon future need to join forces, he insists, concluding the book with an ambitious proposal for an Apollo Program-style combined investment in wind, solar and nuclear power. Mark Lynas is an environmental writer and campaigner. His previous books have drawn attention to the perils of global warming, and he was Climate Advisor to the President of the Maldives from 2009-2011. He is a Visiting Research Associate at Oxford University’s School of Geography and the Environment, and a member of the World Economic Forum’s Global Agenda Council on Emerging Technologies. He recently featured in the movie documentary Pandora’s Promise, which inspired the writing of this book.